In Vancouver, the wife of a millionaire is dead following an explosion in her own home. Everyone thinks her husband is responsible, but former FBI profiler Jefferson Winter isn’t so sure. The method is too perfect; the lack of mistakes, uncanny. He’s seen a series of carefully orchestrated murders – once a year, on exactly the same day, a woman dies in a situation just like this one. That date is fast approaching and Winter knows another victim has been selected. Can he identify the quiet man before he strikes again? 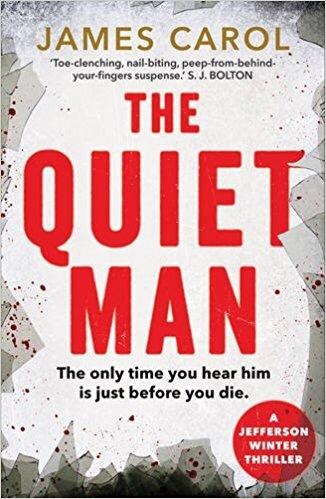 Ive read and loved all of the books and short stories featuring Jefferson Winter so I was thrilled to be able to read and review The Quiet Man as it’s been aaaaaages since I’ve read anything by James Carol. The Quiet Man is another cracking instalment in the Jefferson Winter series. In this one, Winter is tasked with investigating a serial bomber case in Vancouver. Winter is up against the clock as the bomber strikes on the same day every year and he comes into the investigation in the run up to August 5th, the day the attacks usually happen. The thing I love about these books is that we know Winter is the son of a serial killer, but it is never the main focus of the story. It is always there, bubbling under the surface, alluded to often but rarely mentioned. I love the inner turmoil that this causes to Winter, how he uses what he’s seen and knows from his last in trying to get into the mind of the killer. Loved the sense of tension and urgency within this book too. And I really liked the characters Winter works with in this one. Laura is an ex-cop who was on the case, now working out on her own and still investigating the annual bombings. A great female lead, strong and unafraid. One of my favourite book series, and I think that die hard fans of the series will thoroughly enjoy The Quiet Man! Love the tagline for this novel. Great review.